Golf Technologies design and build Golf Studios. A Golf studio designed and built by Golf Technologies allows you to have fully integrated technology solution for all of your requirements. Indoor studios are proven to be effective for Golf Professionals, no more cancelled lessons, technology all set up and ready to go, everything housed and located in the perfect environment. We fully understand that there are different requirements for each studio, and offer experienced guidance in the design phase to ensure your needs are completely met. All Flightscope models work in a studio environment, the perfect fit for multiple technology integrations typically used in a studio environment. Must be good enough for high speed video cameras but not to create too much wash on the hit screen. 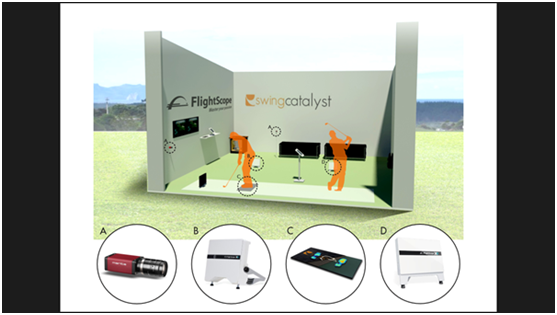 We are the distributors of Swing Catalyst Software which is second to none for functionality, support and ease of use and is built specifically for Golf Studios. This is arguably the best video analysis product on the market today. We partner with Adept Turnkey a leading supplier in Australasia in machine vision technology, partnering with industry leading experts in camera technology ensures a perfect solution each and every time. Your studio has to look great, and maintain that look year after year, our experience in building studios and simulators around the world mean we bring unparralelled experience to the New Zealand market place. Other types of technology supplied by Golf Technologies Ltd that ensures a one stop shop for all your needs. Either by Flightscope Boditak Mat or Swing Catalyst Balance or Force plate, multiple choices ensures you get the very best for your environment. Latest revolution in focusing the mind to maximise your potential. A new partnership with Flightscope and Golf Technologies Ltd that give you access to the biomechanical aspects of a golfers swing.